In the early 13th century, facing grave danger in Palestine, the Carmelites migrated to Europe where they had to adapt to a new way of life. This brought about great hardships for the Order. Saint Simon Stock, then Prior General of the Carmelites, unable to find a solution to their problems, turned to Our Blessed Mother for her assistance. 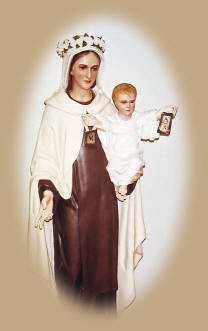 On July 16, 1251, clad in the habit of Carmel, Our Lady appeared to him holding the Infant Jesus in her arms. In her motherly love, she presented to Saint Simon Stock a brown scapular saying:” Receive my beloved son this scapular for your Order. This shall be to you and to all Carmelites a privilege, that whosoever dies clothed in this scapular shall not suffer the eternal fire and if wearing it they die, they shall be saved. It shall be a sign of salvation, a protection in danger and a pledge of peace”. Closer to us, in Fatima, Our Beloved Mother again showed herself as Our Lady of Mount Carmel to the three seers. Later on, Lucie who herself entered Carmel, said: “Our Lady held the scapular in her hand because she wants us all to wear it”. Over the centuries, many miracles have been reported regarding the scapular. Popes, kings and laity wore and still wear the brown scapular. In the life of saints it is said that after Pope Gregory X, St Alphonsus Liguori and Don Bosco had died, their bodies were found decayed but their scapulars preserved intact even after a span of 600 years. Indeed, over the centuries, numerous popes have expressed their love for the brown scapular, a sign of consecration to the Blessed Virgin Mary. Pope John Paul II himself said that he wore the scapular on his heart. The brown scapular is more than just a scapular it is a privileged gift which allows us to partake in ALL the spiritual works of the Carmelite Order. show a special devotion to the Blessed Virgin Mary. The cloth scapular must be used for investiture. One can replace it afterward with the medal.